The USS Ohio, the tanker which turned the tide for Malta in the Second World War has been inducted into the National Maritime Hall of Fame of the American Merchant Marine Museum in New York. The American-built tanker was made available to the British Merchant Navy in 1942 because of its speed and modern design. New York. It formed the heart of Operation Pedestal, the biggest ever convoy in the Mediterranean which included 14 merchant ships. Only five managed to make it to Grand Harbour including the Ohio, with arrived on August 15, 1942m battered, without power and lashed between two destroyers to keep her afloat, but with her precious cargo of oil intact. 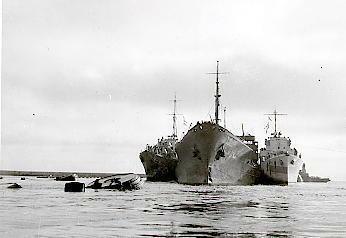 The Ohio was scuttled by the Royal Navy off Malta on Sept. 19, 1946. It was an inglorious end for a vessel that helped Malta survive and that meant so much to Allied victory in World War II. The National Maritime Hall of Fame was established in 1982 to honour the memory of the great people and great ships of maritime history. Coincidentally the recognition given to the Ohio was announced on the day that Malta welcomed into its Grand Harbour the successor of another great ship forever tied to Malta's wartime history - the aircraft carrier HMS Illustrious (see separate story).